Laptop/Case giveaway, and miscellaneous other info! So, I am home today with FeverGirl, which means I can sit and catch up on blogs. I just read about an AWESOMEtastic giveaway, and will post the info here so you, too, can enter to try and win. Win a Compaq CQ10 10-inch screen notebook computer AND a Targus computer backpack by checking out this blog post! Mighty nice...good luck if you enter [and good luck to me, too, of course]. In Olympic Knitting news, I haven't seen the Olympics in almost a week, and have about 4 rows of sleeves to go. Then it's on to the front pieces of the cardigan. So my Olympic pace is a tad slow, but Lily may get this sweater while it still fits. And that I declare as a victory for me! When I post this, I am picking up the knitting AND the remote, for a little DVR'd Olympics action. This fuzzy picture shows two sleeves in progress, slightly less than halfway along. See how fluffy the yarn is? Switching to metal needles did make a big difference in knitability, however. The fluffy, squeaky yarn is moving along the needles pretty easily now. Pretty, no? It's a fitted, lightweight trenchcoat. Bought it as a birthday present to myself after trying it on for fun, on a friend's urging [thanks, Afton!]. It was very inexpensive as coats go, at £20. To be honest, it looks good, but BARELY fits - a little too tight when buttoned. I really, really need to stop derailing my food wagon and say goodbye to the 15 pounds that arrived with winter eating. Looking at this lovely thing is a little incentive to do just that! The cardi continues. I got some great feedback from the designer when I added my project to Ravelry and found hers. So I changed from my lovely Zephyr needles to some plain ole aluminum ones and the knitting is MUCH much smoother. Still feels plasticy on my fingers but it's moving much more quickly. I've finished the back, and am going to cast on both sleeves at once after I post this blog. Haven't gotten a chance to look at the actual Olympics and knit in 3 days, what with all our running about and feeling exhausted by evening. Tonight looks to be better! I think I should be competing in the Olympic category of Finishing a Knitted Item for the Benefit of a Loved One Although It's Completely No Fun to Knit. There is fun in watching the Olympics over the top of my knitting, though. How 'bout those crazy moguls skiers?? Moving on, we have my Around the Corner Scarf, started in November and not really worked on since December...this one's really fun to watch as it grows, but I am not feeling the love for the way I have to pay attention every second to the pattern, which is all short rows and loopy bits. I know it will be worth it, in the end, but my short knitting attention span in the winter has relegated this one to the bottom of the "Basket O' Knits In Progress." Today is Shrove Tuesday, Mardi Gras, Pancake Tuesday. We celebrated by eating LOTS of pancakes for supper at our friends' tonight, and it was lovely. Now I am in a bit of a carb coma, but mmmmmm. Lovely American-style puffy pancakes, syrup and bacon. Lily went with more British-style crepes with lemon and sugar, and ate four. Quite a meal for such a small peanut! Happy Valentine's Day, everyone. Mine's been very nice - chocolate and a phone call from the Faraway Sweetie. Now to business...The knit mojo? She is back. 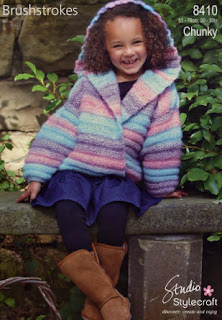 Instead, I'm tackling the lovely cardigan pictured below, for the girlie bean. In exactly that shade, per her request. Here's my Ravelry project link. This is my Olympic Torchlighting Cast-On Picture. See the Opening Ceremonies in the background there? I did DVR and watch them in daylight, given that it was 2 AM or something here when they began. And for the record? Stylecraft Brushstrokes? Pretty color, but hideous, hideous, HIDEOUS to knit with. Squeaky, sticky, icky yarn that makes my teeth itch to work with. Good thing she will love it.